I am so happy to let you know that I am going to write a second cookbook! It will be another book about pies, because you can’t have too much pie I suppose, but this book will be different than the last in that it will focus on gourmet ingredients and high-end flavors. I have a pretty tight deadline for this one but I am confident I can get it all written in time. To celebrate I decided to treat myself. A few years ago I had my first pavlova and I was smitten. What I like best is the mixture of textures. 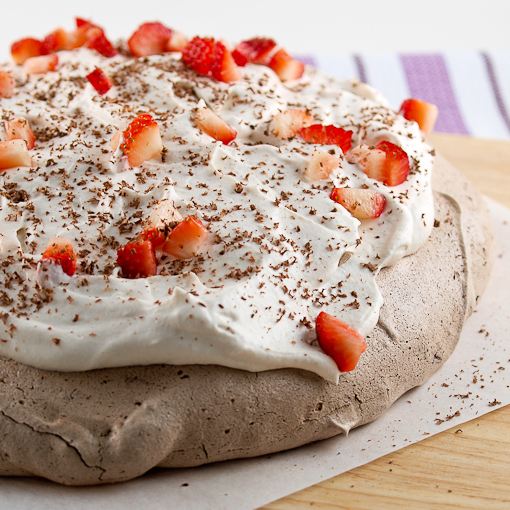 The outside of a pavlova is shatteringly crisp, but the inside is gooey and moist. Topping it all off is a cloud of whipped cream and, in most cases, some fresh fruit. It is the perfect balance of light, fresh, and rich. For my celebratory pavlova I decided to go all out and make a dark chocolate pavlova with melting slivers of chopped chocolate throughout. The result is an ultra rich chocolate flavor that is similar to a chocolate souffle. 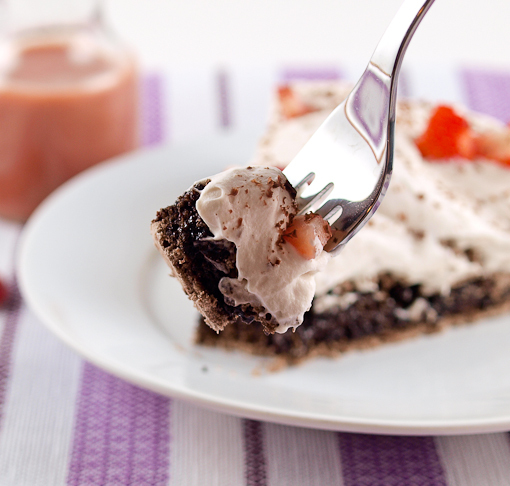 To my whipped cream topping I added added a few tablespoons of fresh strawberry custard sauce. It added the right about of sweetness and strawberry flavor without taking anything away from the chocolate bliss underneath it. 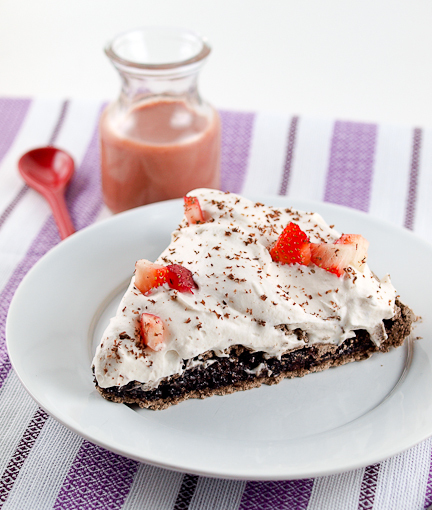 This dessert must be served very soon after it is assembled to preserve the pavlovas crisp crust, but you can make the meringue base a few hours in advance, just leave it uncovered on the counter until ready to serve. This is an easy, and impressive, dessert and perfect for any celebration! Heat the oven to 250 F. Trace an 8-inch circle onto a sheet of parchment paper. Place the paper traced side down onto a sheet pan. 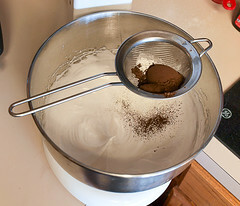 In the work bowl of a stand mixer, or in a large bowl with a hand mixer, add the egg whites and cream of tartar. Begin beating on medium-low speed until the egg whites are frothy then increase the speed to medium-high. Gradually add the sugar. Once all the sugar is added increase the speed to high. Add the vanilla and salt and beat until the egg whites form firm peaks. Sift the cornstarch and cocoa powder over the eggs whites and fold them in until evenly incorporated. 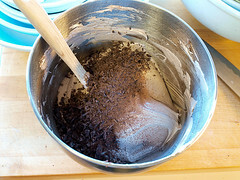 Add the grated chocolate to the egg white mixture and fold in. 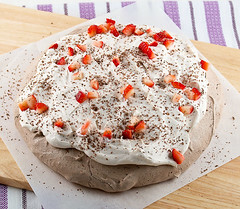 Spread the meringue onto the prepared parchment paper. Bake for 1 hour and 20 minutes, then turn the oven off. 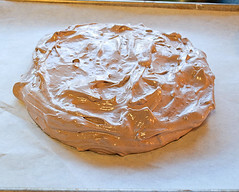 Open the oven door part of the way and allow the meringue to cool for one hour. Once the hour is up remove the meringue from the oven to cool to room temperature. Once the meringue has cooled prepare the strawberry whipped cream. Begin by pureeing the strawberries with the sugar until smooth. 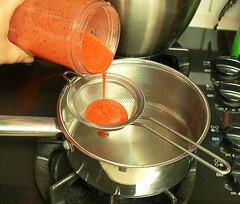 Strain the puree into a small saucepan. 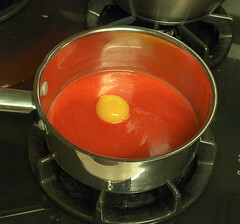 Add the egg yolk and whisk until well combined. Cook the mixture, whisking constantly, over medium heat until it comes to a full boil. 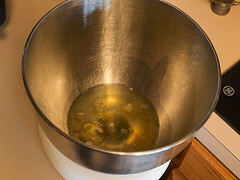 Remove the pan from the heat and whisk in the butter. Chill the mixture until cold. If you are in a hurry you can use an ice bath to chill it quickly. In a small bowl combine the gelatin with the cool water. Let stand ten minutes, then heat in the microwave for 8 to 10 seconds, or until fully melted. Cool to room temperature. In a medium bowl combine the cream with the vanilla. Begin whipping the cream on medium speed until frothy. Increase the speed to high and add in the gelatin mixture along with 2 tablespoons of the strawberry custard. Whip until the cream forms medium peaks. Spread the whipped cream over the meringue. 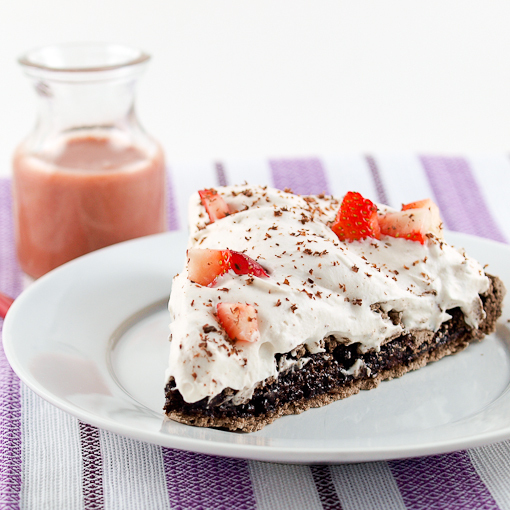 Garnish with diced strawberries and shaved chocolate. 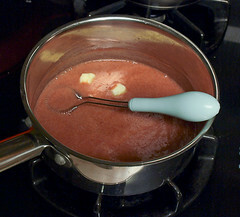 Serve the remaining strawberry custard sauce on the side, if desired.